We are Colum Cille Pipes and Drums from Cape Cod! We are the Cape's premier pipe band, performing all around New England at a wide variety of events such as parades, concerts, festivals and Highland Game competitions. Our repertoire includes a vast array of Scottish, Irish and patriotic American tunes. We are available to hire for your event. Please use the "contact" button above to inquire about how to book the band. With the exception of a concert in Chatham we perform annually, Colum Cille has wrapped up our 2018 campaign. For us, the year was an eventful one! As always, we marched in several parades throughout the course of the year in observance of just about everything from St. Patrick's to Christmas. Although we had a light competition season, we were very pleased to earn placings of "first" and "second" at the two games we attended. Several of our members, particularly our youngsters, brought home individual awards in both piping and drumming at various highland games. The band was honored to play with Andre Rieu and his Johann Strauss Orchestra in Boston in September...a night none of us will soon forget! We added new students and musicians to our ranks, and chose a new Pipe Major. With 2018 in the rearview mirror and 2019 dead ahead, the band is prepping with new music and bigger plans! We plan to continue growing and nurturing our group of students, both young and adult, under the direction of our band piping instructor, Pipe Major David Methven of the Grade 2 Worcester Kilties Pipe Band. We have already chosen four pipe band competitions for next season, and may add others. Also, be sure to keep an eye out here and on our social media accounts. We have plans in the works for a fun fundraiser we are planning for the first part of the new year! 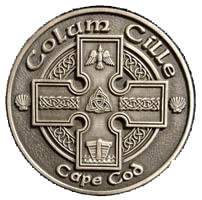 Colum Cille is grateful for all of our supporters who follow the band's activities and come out to see us play. We wish you all Happy Holidays and look forward to performing for all our friends in 2019!